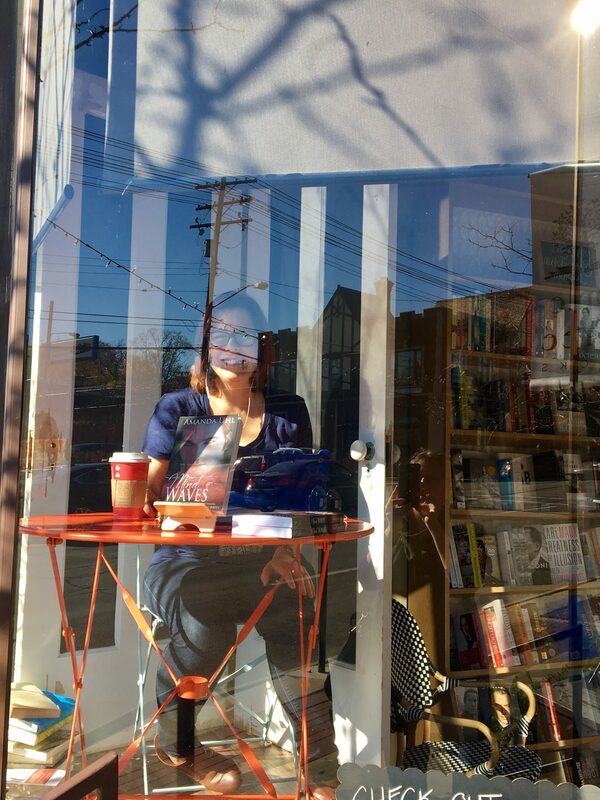 All settled in the window at Appletree Books and ready to write. A few Fridays ago, I spent four hours surrounded by glass, struggling to type the words to my next novel, Cross Waves. 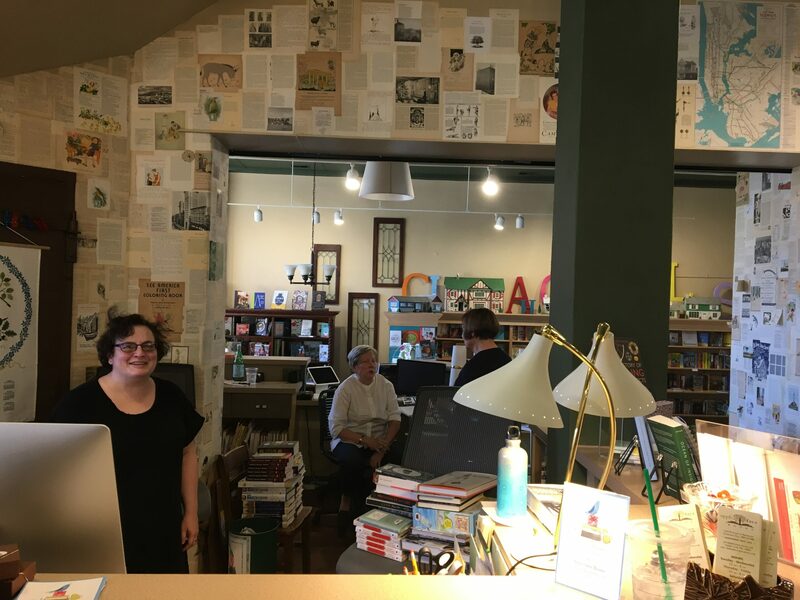 Appletree Books, a quaint bookstore in Cleveland Heights, has been hosting writers all month in honor of National Novel (NaNo) Writing month, which takes place each November. Cross Waves is the second book in my Mind Hackers series, but that doesn’t make it any easier to write than the first. Also, my job as a communications manager doesn’t leave much time to write. So I was expecting big things from my day in the window, eagerly anticipating its arrival. But like most things in life, anticipation is the half the reward. We never know what’s in store. …They’ll give it a try. I attempt to start my car, but the battery is dead. Not even the keys will work to unlock the doors. That’s when my terrific husband figures out I left the lights on the night before. I call the store to tell them I’ll be late, arriving at my destination an hour behind schedule. I push a dollar in quarters in the meter, knowing I’ll need to return two hours later to feed it some more. Starbucks is next door, so of course, I visit the coffee shop to purchase my Chai Tea. Back at the store, hot tea in hand, I size up the window. There isn’t a lot of space for my cup, laptop, iPad, purse and glasses. But I promised to sit in the window, so I set my belongings on the small table, kick off my boots, and hike myself into the tiny seat, making a mental note to start that Yoga class soon. The weather is unseasonably warm for November–a balmy 72 degrees. Sunlight streams through the tall glass. I open my laptop, hands poised above the keys. Sweat beads on my forehead. I’d received a few tips from writer friends who’d sat in the window earlier in the month to dress in layers. I strip. Off goes my vest, shirt and socks. There I sit in t-shirt and jeans, my bare feet resting on my purse, feeling a bit like a plant in a greenhouse about to die of heat stroke. A little encouragement from a spectator. 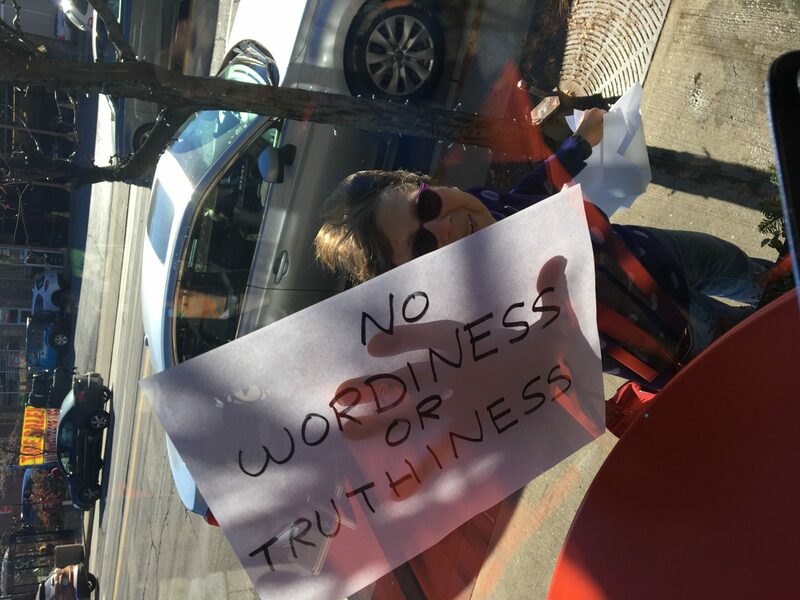 My fellow writer in the opposite window is a local whose friends stop by in a steady stream. One of them holds up a sign to spur me along. I’d better start writing. I push my laptop back an inch and bump my tea. I watch in horror as it dumps to the floor, muddy brown liquid dripping on the wood and into my open purse. Ugg. Down from the window I go in search of paper towels. I return and get settled again. The writer is changing in the next window. My friend Marin arrives, taking her turn behind the glass. “I need a water,” she says. Off she goes to the Starbucks next door. 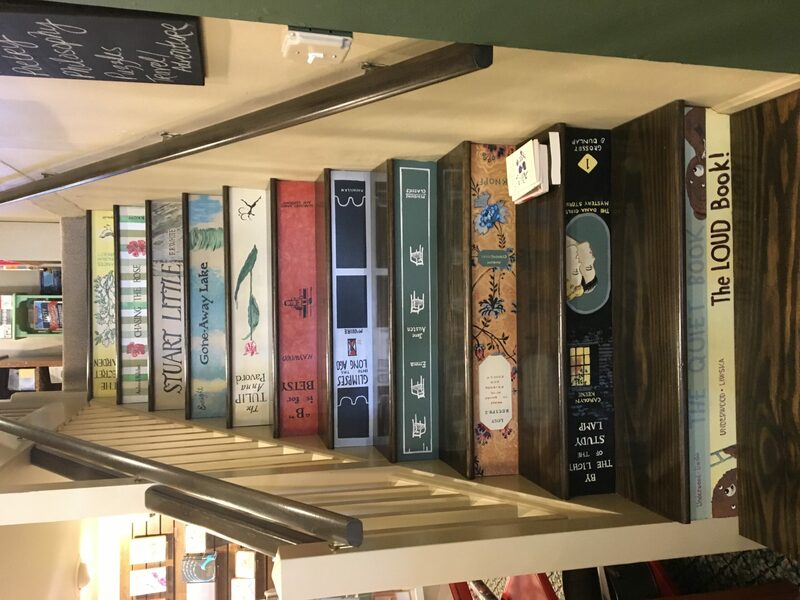 A fairytale bookstore–I want these steps in my home. I type a sentence or two. I haven’t worked on this story in six months. I struggle to recall the plot. I reread. Marin returns, water in hand, which makes me wonder what time it is. I look for my cell phone. It’s gone! I must have left it in the car. What if someone needs me? I scramble down from my perch, slip on my boots and grab my keys. Off I trot to the car to find my cell on the front seat. Good timing as the meter needs fed. Except my change is in my purse at the store. Sigh. Back I go to retrieve my purse, my heels clunking on the hard pavement. You should be writing…you should be writing…they seem to chant. I feed the meter and return to the store. Up I climb in the saddle again. A man comes by with a large, expensive-looking camera. He motions to take my picture. I nod. Dutifully, I smile, wondering where the photo might end up. I write a few more sentences, fanning my face in between. Sweat trickles down my back. Marin tells me she’s had enough and exits the window for a cooler table in the next room. I briefly contemplate doing the same. But then, what’s the point? I came out here to write in the window and write I will! I place my determined hands back on the keyboard. A few more sentences appear on the page. Yahoo! It’s now a paragraph. I’m writing. I’m writing! My gracious hosts at Appletree Books. Notice the book wallpaper behind the counter. The store owner approaches. “I’m heading to Starbucks. Would you like an ice-water?” she asks. Would I like an ice-water? “Yes, please,” I say, looking at her like she’s my fairy godmother, and I’m going to the ball. I write a few more sentences. The words are coming easier now. I check my word count. 500 new words. Yay. The store owner returns with the largest ice-water I’ve ever seen. “Bless you,” I say, and I mean it. I wrap my hot hands around the giant cup and bask in the instant relief. Now all I need is a sandwich. I check the time on my cell phone. Two o’clock. My time under glass has come to an end. Marin decides she’s heading back to the office, so I take a solitary lunch at the restaurant next door, selecting a seat far from the window. I prop open my iPad and churn out a thousand words. Thanks! It was fun but probably easier on a cooler day. Great bookstore if you haven’t been. Enjoyed your post. Looks a little warm. Love the quaint looking book store. What a wonderful day! Yet, I would become so distracted by everything around me. I must have solitude, so I applaud any writer who can write in places surrounded by others. Thanks for sharing! Yes, a bit unusual for most introverted writers. I was definitely more productive when I left the window. But it was fun to be in the Spotlight for a brief time. And great idea for the store to do!